Intra-fraction motion management has become increasingly important for physicians wanting to pursue reduced margin hypo-fractionated therapy or advanced Stereotactic Ablative Body Radiotherapy (SABR) and Stereotactic Body Radiotherapy (SBRT). 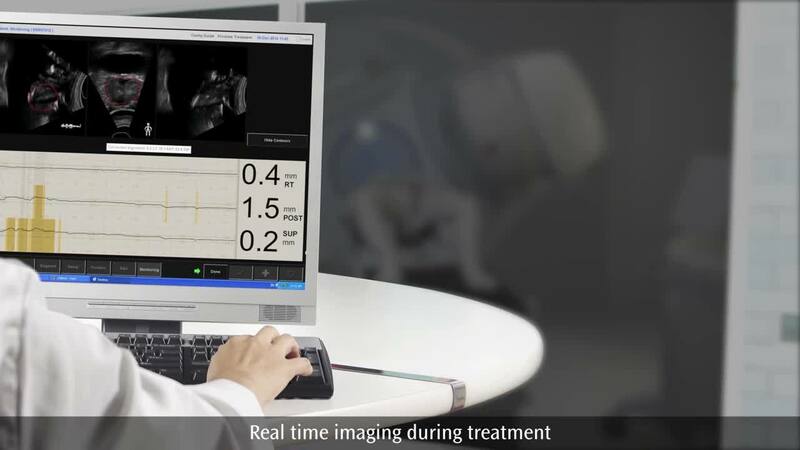 Clarity 4D Monitoring during prostate treatment offers live imaging of the target and surrounding anatomy. The target position is automatically calculated and compared to physician action thresholds to enable precise intra-fraction motion management. With Clarity, clinicians can see and monitor soft-tissue anatomy—without needing extra ionizing imaging or surgically inserted markers. The Clarity robotic acquisition apparatus has been designed for patient comfort and for easily repeatable imaging results at each fraction. Once in place, imaging can be initiated and controlled remotely from the treatment control area.